Creek Week concludes, in today’s post. 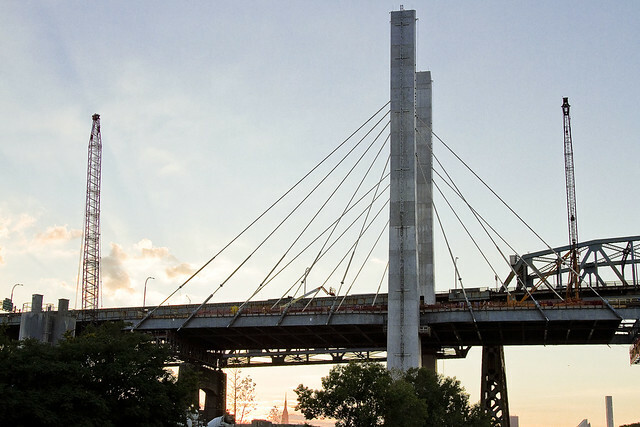 That’s the Kosciuszcko Bridge replacement project pictured above, with the 1939 Robert Moses model bridge providing a backdrop to the under construction cable stay model. That’s the Brooklyn side, for the curious. This is a $1.2 billion replacement effort, “fast tracked” by Governor Cuomo, which is intended to replace what’s considered to be the most dangerous bridge in New York State – which happens to carry hundreds of thousands of vehicle trips a day as the Brooklyn Queens Expressway runs across its 2.1 mile long structure (along with its approaches). 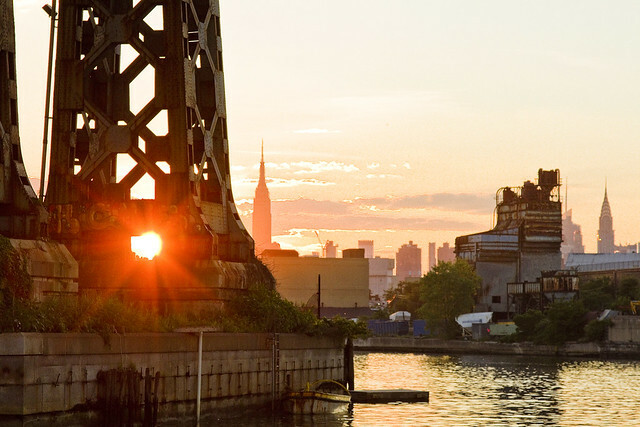 These shots were captured while onboard a NY Water Taxi hired for the evening by the Open House NY organization, and my colleague T. Willis Elkins and I were onboard to represent Newtown Creek Alliance and narrate to two sold out crowds. 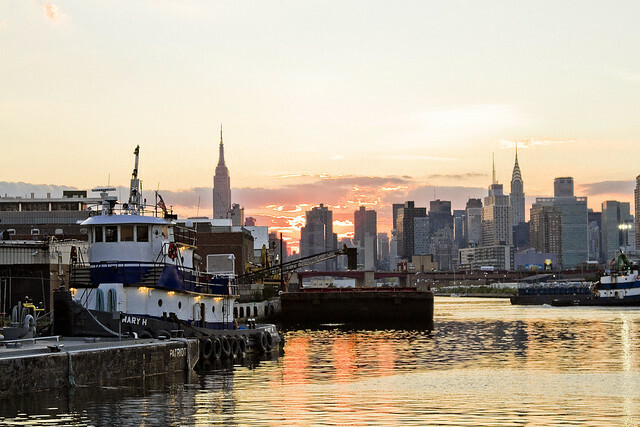 The second trip was heading back out from the Newtown Creek towards the East River just as sunset was occurring, and as always – Newtown Creek was and is a visual spectacular. One has been trying to capture as many angles and shots as possible of the old Kosciuszcko Bridge for a couple of years now, simply because within the next 24-36 months it will have been eradicated from common memory. This whole “Newtown Creek Historian” business isn’t just about revealing the past, it’s about leaving behind a visual record for those who haven’t been born yet about what the place looked like during its superfund and early 21st century transformational period. I’ve mentioned it before, but the plan which the State DOT has put forward is that once the eastern side of the new bridge is complete, they are going to reroute the BQE onto it. Then, they’re going to demolish the 1939 model, and in its footprint, build the western section of the new cable stay bridge. The great news about that is that there is going to be a pedestrian and bicycle path on the western side of the bridge. One looks forward to walking the camera across, and getting aerial shots from up there. The burning thermonuclear eye of God itself was setting in the west as our NY Water Taxi navigated back towards the East River. That’s Blissville in Queens on the right hand side of the shot above, and the former location of not just Charles Pratt’s “Queens County Oil Works” but just about the very spot where the first large scale oil refinery in the United States – Abraham Gesner’s “North American Kerosene Gas Light Company” was founded. 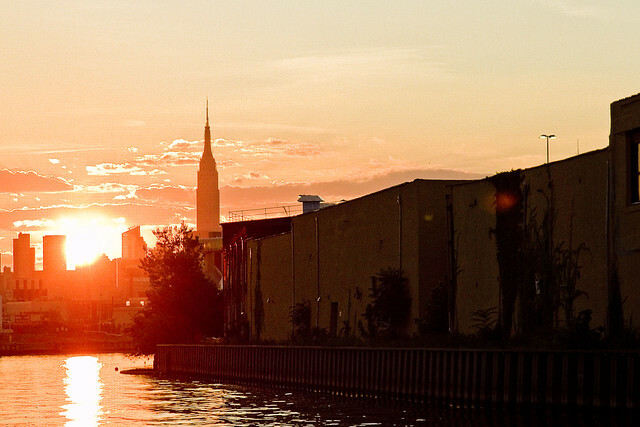 On the Brooklyn or Greenpoint side of Newtown Creek, the former home of the Standard Oil Company of New York and birthplace of what would be one day known as Mobil Oil is closest to the camera, which are now the ExxonMobil Greenpoint Remediation Project properties at 400 Kingsland Avenue. 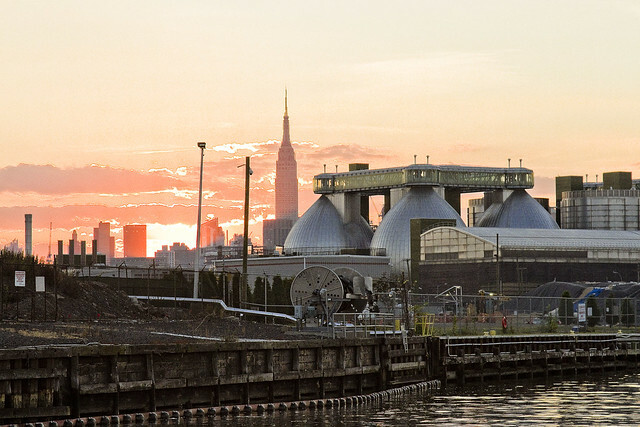 Sitting on part of the former oil company properties in Greenpoint is the NYC DEP’s Newtown Creek Wastewater Treatment Plant, largest and newest of NYC’s 14 sewer plants. 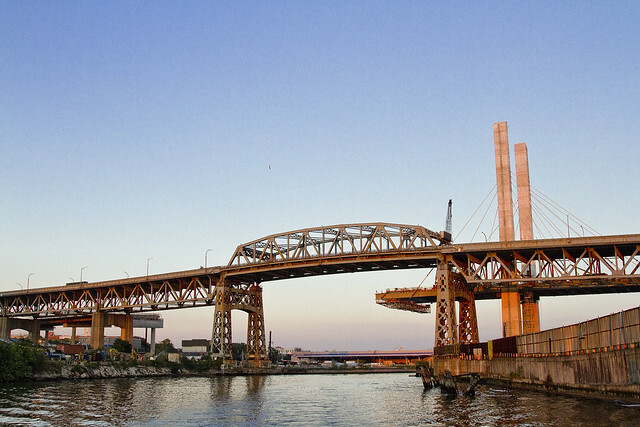 DUGABO – or Down Under the Greenpoint Avenue Bridge Onramp – is the heart of petroleum country on Newtown Creek. Greenpoint Avenue heads west into Brooklyn, terminating at the East River at Transmitter Park, whereas it continues into Queens and once having crossed Queens Blvd. 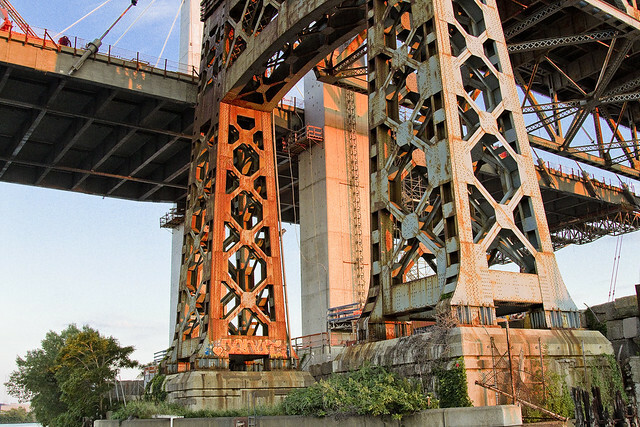 – it transmogrifies into Roosevelt Avenue and continues all the way out into Flushing. 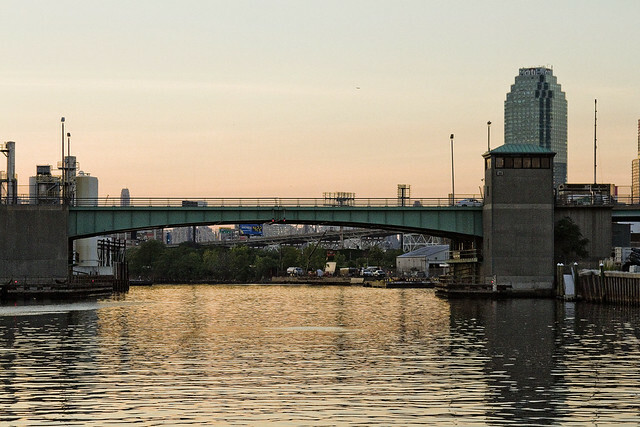 From a maritime industrial point of view, the DUGABO area surrounding the Greenpoint Avenue Bridge is probably one of the busiest sections of Newtown Creek in the 21st century. SimsMetal and Allocco Recycling host regular tug and barge traffic, as does Metro fuel. In the distance is the Pualski Bridge and the towers of the Shining City of Manhattan.